Dr. Wu and her staff are super personable and caring. Every time I go in for a visit I know I’m in the best hands! Dr Wu is a great doctor. Very attentive and thoughtful. Dr Wu is the best! She takes her time and addresses all your concerns. I would recommend her highly. Dr. Wu is very approachable, easy to talk to to,and listens to and answers all questions in a thilorough manner. I also appreciate that her office staff is friendly, and my wait time vis avis my appointment time is vert short. I have been going to Dr. Wu for over 20 years. She is very gentle, caring and professional. I have referred quite a few of my friends to her. Bill has been there for a number of years, and always willing to help with any issues. Liking the new girl Katie too!! Very experienced..compassionate .. erudite.. the best..
Dr. Wu took time to explained the procedure. She checked on me the entire time. Thanks Dr. Wu. Dr. Wu is a superb physician who spends time listening. The office staff is personable and helpful and the office is well run. 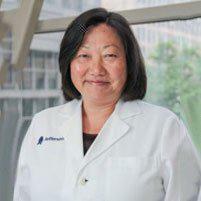 Dr. Christine Wu is very professional, knowledgeable and kind. She listens carefully and pays attention to details. I would strongly recommend her expertise. Saw Dr. Wu for post surgical exam. Dr. Wu explained how the procedure went in a way that a lay person could readily understand. She was compassionate and also very professional. She is gentle in the way she examines you but does not sacrifice thoroughness. Bill and Katie, her office staff are great too. Dr. Wu is everything you could want in a doctor. I have been with her for over 20 years and she’s given me the best guidance whenever needed. Her staff is wonderful as well. Dr. Wu has been my doctor for twenty plus years. When I had breast cancer, she referred me to the very best surgeon. I feel she saved my life. She is careful and thorough and gives great advice. She is the very best! Dr. Wu did a post surgical examination today. She was very thorough. Her office manager, Bill, has been helpful and efficient. I highly recommend Dr. Wu as an excellent and knowledgeable doctor. Excellent physician. She takes her time to explain medical issues, values patient input, and very thorough. I have been a patient of Dr. Wu for 20+ years. She is a very knoledgeable dr., that listens and allows as much time as needed. The staff is friendly and very helpful! Went for my yearly exam today. The staff is friendly and efficient. Dr Wu is professional, kind and always answers all of my questions. I’ve been a patient of Dr Wu’s for about 15 years and feel very confident in her care. I was seen on time. The office staff were courteous and helpful. Dr. Wu spent time with me discussing my health and her recommendations. I was pleased with the visit.